Ulysses Simpson Grant was the 18th President of the United States of America, serving from 1869 to 1877. won fame for his victories at Ft. Donaldson (1862), Shiloh (1862), and Vicksburg (1863), and his grueling but successful war of attrition against Robert E. Lee. who surrendered to Grant at Appomattox in April, 1865, ending the Civil War. As president he supported the Radical Republicans in the program for reconstruction, defeated the Ku Klux Klan, and supported civil rights for the Freedmen (freed slaves). In foreign policy he settled a major conflict with Britain regarding the Civil War. Although personally honest, Grant gave out patronage too generously to his loyalists, and protected senior corrupt officials. The Panic of 1873 made his second term one of economic depression, and allowed the Democrats to regain control of the House in 1876. Grant made a celebrated tour around the world, but came back in 1880 to try for a third term and failed. His finances, ruined by a dishonest associate and while dying of throat cancer, wrote a brilliant memoir of his military service; it stands as one of the great monuments in military historiography, and his battlefield achievements rank him as one of the great generals in world history. Grant was born April 27, 1822, in a two-room cabin at Point Pleasant, Ohio. His father, Jesse Root Grant, was descended from undistinguished Puritan forebears who had immigrated to Massachusetts in the early 17th century. His mother, Hannah Simpson Grant, was a typical hard-working and pious frontier woman. The elder Grant was a tanner who by hard work and native shrewdness managed to acquire a modest competence. Lacking much education himself, he was determined that his sons should have the best the community offered. From the time he was 6 until he was nearly 17, young Grant regularly attended school, first in Georgetown, Ohio, to which the family had moved soon after he was born, and later at nearby academies. While working on the family, he developed a fondness for horses almost amounting to a passion, and a liking for outdoor life that in after years stood him in good stead. In 1839, his father obtained for him an appointment to the United States Military Academy at West Point. In making out the necessary papers, the congressman erroneously wrote his name as Ulysses Simpson Grant (Simpson was his mother's name) instead of Hiram Ulysses Grant, the name with which he had been christened. His name was so entered on the rolls of the Military Academy. Grant never liked his old initials H.U.G. and took the new mane. Except for his horsemanship Grant did not distinguish himself at West Point, which had an engineering curriculum. Graduating in 1843, twenty-first in a class of thirty-nine, he was sent to the infantry instead of to the cavalry, his choice. He served at various posts in Missouri and Louisiana, but in 1845 he was ordered to accompany General Zachary Taylor to Texas and later served in the invasion of Mexico. Subsequently, he was transferred to General Winfield Scott's army in time to participate in the march on Mexico City. Grant handled logistics, and did not have a combat role, but he was twice cited for gallantry under fire. He was an unusually keen observer of terrain, battle formations, and the actions of commanders, and by happenstance was involved in most of the major battles of the war. In later years he said it was an unjust war, but he did not say that at the time. Stationed at Jefferson Barracks, Missouri, after the Mexican War, in August 1848 he married Julia Dent, daughter of a Missouri planter and slaveowner. Four years later, now a captain, Grant was transferred to the Fort Humboldt, in far northern California; his wife could not accompany him because of the hardships of the trip. Unhappy because of the loneliness and enforced separation, Grant, still a first lieutenant, started drinking. "I do nothing here but set in my room and read and occasionally take a short ride on one of the public horses," he wrote his wife. His commander, Lt Col Col. Robert C. Buchanan Buchanan, hated him and forced him to resign. The six years that followed were the most disappointing of his life. He tried farming on land in the St. Louis area owned by his wife's father. He failed at that, at selling real estate, and at clerking in a customs house. He owned one slave and voted Democratic. In financial straits, he finally turned to his own family and became a clerk in a Galena, Illinois, leather store owned by his two brothers. As the demand for West Point graduates increased after the start of the Civil War, Grant rejoined the army. As the chief trainer of Illinois regiments he attracted immediate attention for his striking command skills and was soon given control of Union forces in southern Illinois. After Grant's early successes, Henry Halleck, his commanding general, became jealous and removed him from his command. Halleck's stopped trying to discredit Grant came when he and Grant found common cause in countering General John McClernand's independent efforts to preempt Grant's operations in the Mississippi Valley in October 1862 without Halleck's approval. Washington was watching closely and soon gave Grant another field command. In 1862-63, after a long arduous campaign against five poorly coordinate Confederate armies, Grant captured Vicksburg on July 4, 1863, giving the Union control of the entire Mississippi River, which permanently cut off Texas and Arkansas from the rest of the Confederacy. In a major campaign in the Mississippi swamps, Grant defeated Confederate general John C. Pemberton's army and freed the way for him to capture Jackson, the capital of Mississippi. Then, looping back, he forced Pemberton's army into Vicksburg in the Battle of Champion's Hill on 16 May 1863. With help from Admiral David D. Porter's gunboats, he captured Vicksburg after a month-long siege and bombardment which nearly ruined the city. Late in the year, Lincoln gave Grant command of the entire United States Army. Grant took command of all the Union armies on March 9, 1864, and had to think out a war-winning strategy. He had already been discussing ideas with Halleck, the chief of staff based in Washington. Halleck was now subordinate to Grant and worked to implement Grant's ideas. Grant's strategy entailed complex coordination within and between theaters. He wanted not only to attack the enemy's armies, but also to sever their logistical ties. It was a bold plan that relied more on maneuver than bloody engagements. In the West, Grant assigned the major thrust to his ablest general and good friend, William T. Sherman. Sherman was to use three armies and advance from Chattanooga against General Joseph E. Johnston's Confederate Army of Tennessee and push toward Atlanta, the region's vital railroad center. Grant made clear the campaign's primary objective: "You I propose to move against Johnston's army, to break it up and get into the interior of the enemy's country as far as you can, inflicting all the damage as you can against their war resources." The conduct of the operation Grant left to Sherman. Grant wanted a joint army-navy expedition against Mobile, the Confederacy's remaining major port on the Gulf of Mexico. Lincoln, however, was concerned with Reconstruction and insisted on a movement up the Red River in Louisiana to strengthen the efforts of the state's Unionists' to create a new state government. Major General Nathaniel P. Banks, an officer with powerful political connections and a favorite of Lincoln's, commanded the movement, which was a major fiasco; Banks was defeated and narrowly managed to get his army out. In the East, Grant first planned to invade North Carolina and cut off Richmond. Lincoln insisted that Richmond had to be the target, so Grant decided on a three-pronged offensive in Virginia. The main Union combat army (nominally under George Meade, but with Grant in actual control) would attack the Confederacy's premier force — General Robert E. Lee's Army of Northern Virginia. Simultaneously Grant ordered separate forces to cut Lee's railroads (a partial success), and to destroy Lee's supply base by laying waste to the farms in Virginia's Shenandoah Valley (a major success). He sent Major General Benjamin F. Butler, to cut the rail lines leading into Richmond from the South, but Butler failed badly. Beginning with the Battle of the Wilderness in summer 1864, Grant pressed the Confederate Army through a series of battles that made up the Overland Campaign. By June, the two armies were settled in entrenchments around the important city of Petersburg, Virginia. After a long siege, Grant successfully broke the Confederate supply lines, forcing them to retreat in the Appomattox Campaign. Robert E. Lee eventually surrendered at Appomattox Court House. Following the conclusion of the war, Grant remained on active duty and was promoted to become the first four-star general in the history of the United States Army. Commanding the entire Army, Grant was responsible for operations in the Western U. S. against Native Americans until he resigned his commission to become President in early March 1869. With the assassination of Lincoln as the war ended, Grant had enormous military and political authority, but he was slow to use it. President Andrew Johnson tried, especially during the elections for Congress in 1866, to use Grant's prestige to bolster the faltering presidency. Grant, sympathetic to his black soldiers, moved toward the Radical Republicans who were determined to block Johnson's lenient policy toward the South. The Radicals put Grant's army back in control of the South in 1867, as Radical reconstruction began. Grant enormous prestige made his the nearly unanimous choice for the Republican presidential nomination in 1868, and he easily defeated Horatio Seymour, the Democrat who ran on a white supremacy platform. Grant, a superb general, lacked political skills. He had a tin ear for public opinion regarding corruption, he was excessively loyal to his old army friends, he had a weak staff system in the White House, and he had too narrow a range of advisers. His first cabinet appointments were personal friends and men of wealth, and they had a steep learning curve on their jobs. Many had to be replaced. Grant assumed that he could order subordinates to do this or that, but he did not have a system for following up his orders and planning was poor. Grant lacked the skills of persuasiveness, tact, and the insight into character that astute politicians relied upon; he relied too much on his own enormous military prestige. Grant took firm stands, right or wrong, and rarely compromised. He was firm for sound currency and opposed inflation as a means of paying the war debt. He supported the Freedmen and Carpetbaggers in the South, despite growing disgust with news of widespread corruption. He helped Congress pass the Enforcement Acts, which entangled the army in local affairs in the South. Grant's notorious hostility toward the principles of civil service and merit disgusted reformers who demanded efficiency in government, rather than payoffs to old buddies. Most of all he refused to recognize that Reconstruction was a success, and that further use of the army violated the principles of Republicanism. By 1872 many leading Republicans—including many of the founding fathers of the parties—were thoroughly alienated and they formed the Liberal Republican movement. Its main goals were to block the reelection of Grant, to end reconstruction and facilitate the peaceful reintegration of the South, to suspend high protective tariffs, and to replace the patronage-ridden system of giving out government jobs with a merit-based civil service. The Liberal Republicans failed to defeat Grant's reelection, running a weak oddball candidate in Horace Greeley. Grant scored a landslide. In 1870, President Grant recommended to Congress that the United States annex the predominantly black Dominican Republic for political and economic reasons. Annexation was also supported by elements within the Dominican government who saw it as a way of dealing with a Haiti-inspired rebellion. Massachusetts senator Charles Sumner, chairman of the Foreign Relations Committee was strenuously opposed. Sumner complained it threatened Haitian sovereignty, but also promised a major setback to abolitionist dreams of nonwhite countries asserting and maintaining political independence. Sumner believed that races are uniquely designed for particular habitats and that whites were not suited to colonize areas like the Dominican Republic. Sumner averred that American expansion was only appropriate in temperate zones. Sumner did sytop the annexation, which never happened. Sumner also broke with the Republican Party and supported the Liberal Republicans, along with about a fourth of the former abolitionists. Grant retaliated by having his allies in the Senate strip Sumner of his powerful chairmanship. Grant's first term ranks him among the ablest presidents, with a series of major achievements regarding energetic enforcement of the rights of freedmen combined with conciliation of former Confederates, destruction of the KKK, passage of the 15th Amendment, reform in Indian policy, successful negotiation of the Alabama Claims with Britain and easing tensions with Britain, and for an era of peace and prosperity. Unfortunately Grant was elected to a second term. Grant's second term was a series of disasters that ruined his political reputation. Most reformers had broken with him and joined the Liberal Republican movement, leaving the president surrounded by the most corrupt elements of the Republican party. The Panic of 1873 was a major nationwide economic depression that (temporarily) ruined the railroad industry and halted expansion. For the first time workers engaged in large-scale violent strikes that soured the atmonsphere. The Democrats took control of the House, but not the Senate, leading to a political stalemate in Washington. The pietistic reformers who had formed the core of the Republican party now turned to other reforms, especially temperance (prohibition of the sale of liquor), and no longer provided a moral base for the party in Washington. Indeed, the Democrats now took on the mantle of reformers, as the conservative, pro-business Bourbon Democrats, led by New York Governor Samuel Tilden destroyed the Tweed Ring in New York City and led the attack on the spoilesmen around the president. Round after round of scandals were exposed, with Grant usually siding with the villains and fighting the whistle-blowers. His death and funeral became an occasion for a religiously tinged emotional and political reconciliation of North and South and as such is a critical event in the history of the political culture of the United States. "I am sorry General Grant is dead," proclaimed ex-Confederate general and pallbearer Simon Bolivar Buckner, "but his death has yet been the greatest blessing the country has ever received, now, reunion is perfect." The Ulysses S. Grant Association, with help from Southern Illinois University, the National Endowment for the Humanities, and the National Historical Publications and Records Commission, is in the process of publishing an exhaustive, annotated series of volumes of Grant documents. Also in the works is a scholarly edition of the Personal Memoirs of U. S. Grant. 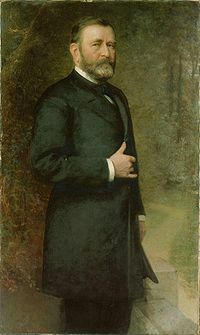 Throughout the 20th century Grant was considered one of the two or three worst presidents, because of the corruption he tolerated, his misplaced loyalty to old comrades, his disdain for good government and rejection of good advice, his Reconstruction policies that favored the Republican party at the expense of the republican principles on which the party as founded, and the economic disaster that struck the nation in the panic of 1873, making his second term a period of hardship. In recent years Grant's reputation as president has improved somewhat. Smith (2002) is typical in that it acknowledges Grant's flaws, but portrays him as a man of character and as the ultimate pragmatist, a man whose virtues and achievements far outweighed the faults and scandals often associated with his career. Grant's military reputation stands very high indeed, except in the one area of moral judgment, whether he sacrificed thousands of lives in a meat grinder war of attrition. Smith (2002) highlights the pragmatic Grant, willing to violate the orthodoxies of military strategy as he learned what the battlefield taught and forgot what the old textbooks said. For Grant warfare was an end in itself, a kind of brutal game among rival commanders. Smith (2002) wants to challenge what he sees as a common historical image of Grant as a general whose victories may be attributed to a simple willingness to sacrifice troops in battle, but he still presents a Grant remarkably willing to sacrifice troops in a conflict he defined as, ultimately, a war of attrition. Princeton professor Sean Wilentz contends that "although slandered since his death, Grant, as general and as president, stood second only to Abraham Lincoln as the vindicator of those principles in the Civil War era." Williams, T. Harry, McClellan, Sherman and Grant. 1962. Ballard, Michael B., Vicksburg, The Campaign that Opened the Mississippi, (2004), ISBN 0-8078-2893-9. Bearss, Edwin C., The Vicksburg Campaign, 3 volumes, 1991, ISBN 0-89029-308-2. Catton, Bruce, Grant Moves South, 1960, ISBN 0-316-13207-1; * Gott, Kendall D., Where the South Lost the War: An Analysis of the Fort Henry-Fort Donelson Campaign, February 1862, 2003, ISBN 0-8117-0049-6. McDonough, James Lee, Shiloh: In Hell before Night (1977). McDonough, James Lee, Chattanooga: A Death Grip on the Confederacy (1984). Miers, Earl Schenck., The Web of Victory: Grant at Vicksburg. 1955. Davis, William C. Death in the Trenches: Grant at Petersburg (1986). Maney, R. Wayne, Marching to Cold Harbor. Victory and Failure, 1864 (1994). Miller, J. Michael, The North Anna Campaign: "Even to Hell Itself," May 21–26, 1864 (1989). ↑ There was no disgrace involved. In the 1860s Buchanan was repeatedly challenged on why he forced out the greatest soldier of the era, and came up with the drinking story. Grant drank less than the others at the remote post. ↑ "Liberal" in the 1870s is nore similar to "libertarian" in the 21st century and has little in common with current liberalism. ↑ Joan Waugh, "'Pageantry of Woe': The Funeral of Ulysses S. Grant." - Civil War History. 51#2 (2005) PP 151+ online edition. This page has been accessed 68,988 times.